Queen of Pentacles (R) says it is time that you recognize and accept your need for stable, nurturing relationships in your life. Begin to release the people in your life who find it difficult to trust anyone. The fear of failing can make a person quite changeable. Soon they develop a suspicious nature and lack any motivation – which causes them to be lazy and neglect their responsibilities. This results in nervousness and confusion – they become afraid, mistrustful of others and even begin to doubt their abilities and their value as a person. Trust yourself – focus all your energy on utilizing your abilities to manifest beauty, health and fulfillment in specific, practical ways in the areas of your life where it is needed and necessary. Focus on your meditation, on grounding your emotions in natural things, ordinary pleasures and satisfying work. In the first position: Many will look to you, as those who wait to see which fork the hostess picks up first. In the third position: this suggests that you are needed to help another or others with their physical/material house, especially diet, exercise and health matters and/or environmental concerns. In the fourth position: A mother figure may be distorted, even rejected. Also, at an extreme, this archetype can become an obsession with nature and/or science. In the fifth position: You may think adversely about this queen or she about you. As an aspect of yourself, you may be avoiding thinking about the appropriateness and efficiency of your actions in physical/material matters. In the sixth position: If this is someone already in your life there are emotions to deal with here, as one or the other of you turn away. In the seventh position: If this represents someone already in your life, this may show a turn of mind between you. There may be a tendency to fear the forces of nature, that shows up in a propensity for too much civilization, too much technology in your solutions. 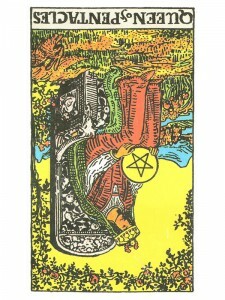 In the eighth position: There may be disharmony between this archetype and your Physical/material Plane. The atmosphere will be less than pleasant until it is satisfied. these cards are so cool. Thanks for these interpretations. Other sites have also helped, but this one… its for those going the next step up. I see now that the interpretation doesn’t really matter. My spiritual, eternal self will guide me to what I need to know no matter how the card is interpreted – it could be interpreted completely wrong and still be used.